If you're looking for a great (and cheap!) 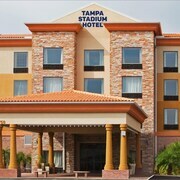 hotel in Tampa, CheapTickets is the best place to find them. We offer deals on the best 202 hotels throughout Tampa. No matter what you're looking for, we have options for you. Grab great rates on the 72 affordable 3-star hotels that are easy on the wallet without sacrificing comfort. Looking for more luxury? Try one of the 11, 4-star hotel accommodations in Tampa. No matter your budget needs, we've pulled out all the stops to make sure you have plenty of vacation options. Maybe you prefer to search for your hotel deals based on what each hotel offers? For example, let's say you just want to find a hotel or resort that has a pool to cool off in after a long day exploring Tampa. Scroll down to choose from the 145 hotels in Tampa that has a pool for guests. Or search for deals on Tampa hotels offering free wifi or breakfast, non-smoking rooms, and more! CheapTickets is here to be your personal travel agent for your next trip to Tampa. Get booking today! What hotels in Tampa offer free wifi access? Are there deals on Tampa hotels offering free breakfast? Yes! The only thing better than finding a great deal on a cheap hotel in Tampa is finding one that offers free breakfast. Grab some eggs, a waffle, or some healthy oatmeal before a day full of exploring Tampa and all that it has to offer. Below are just some of the many hotels that offer free breakfast in Tampa. DoubleTree Suites by Hilton Tampa Bay is a 3.50 star rated hotel property in Tampa that offers free breakfast. Extended Stay America - Tampa - Airport - N. West Shore Blvd is a 2.50 star rated hotel property in Tampa that offers free breakfast. Howard Johnson Hotel by Wyndham Tampa Airport/Stadium is a 2.00 star rated hotel property in Tampa that offers free breakfast. The Westshore Grand- A Tribute Portfolio Hotel- Tampa is a 4.00 star rated hotel property in Tampa that offers free breakfast. What about deals on pet-friendly hotels in Tampa? Tampa is a great place to get outside and explore with your pets in tow so don't leave your furry friends behind. Below you'll find great deals on hotels in Tampa that allow pets. Don't forget to bring plenty of treats! Vista Inn and Suites Tampa is a popular, pet-friendly, 2.00 star hotel in Tampa. Holiday Inn Express & Suites Tampa USF Busch Gardens is a popular, pet-friendly, 2.50 star hotel in Tampa. 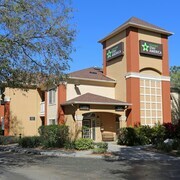 Extended Stay America - Tampa - North - USF-Attractions is a popular, pet-friendly, 2.50 star hotel in Tampa. Red Roof Inn Tampa - Brandon is a popular, pet-friendly, 2.00 star hotel in Tampa. Any good rates on Tampa hotels with restaurants? Absolutely. Don't want to deal with planning our all your meals on your trip to Tampa? We don't blame you. Keep the hangry away by staying in one of the 55 hotels that have restaurants. With a room at one of these spots, all it takes to get a good meal is hopping in the elevator. Check out some of the most popular hotels in Tampa that have restaurants below. Book DoubleTree by Hilton Hotel Tampa Airport - WestshoreDoubleTree by Hilton Hotel Tampa Airport - Westshore is a 3.50 star hotel and has one or more restaurant options. Book Grand Hyatt Tampa BayGrand Hyatt Tampa Bay is a 4.00 star hotel and has one or more restaurant options. 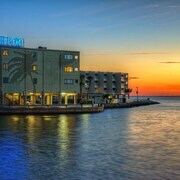 Book Le Meridien TampaLe Meridien Tampa is a 4.00 star hotel and has one or more restaurant options. Book Clarion Inn and Conference Center Tampa - BrandonClarion Inn and Conference Center Tampa - Brandon is a 2.50 star hotel and has one or more restaurant options. What are the cheapest hotels in Tampa with pools? What's better after a long day exploring Tampa then a relaxing dip in a pool? Finding the Tampa hotel you need for a bargain! Cool off and unwind at one of our 145 Tampa hotels with a pool. Browse some of the top deals on these hotels and resorts with pools in Tampa below, but be warned: You may not want to check out! Tampa Inn - Near Busch Gardens has a pool and a 2.00 star rating. Sheraton Tampa Riverwalk Hotel has a pool and a 3.50 star rating. Crowne Plaza Tampa - Westshore has a pool and a 3.50 star rating. Country Inn & Suites by Radisson- Tampa East- FL has a pool and a 2.50 star rating. What hotels in Tampa offer parking for guests? Once you've made your way to Tampa, the last thing you want to deal with is finding parking close to your hotel. Avoid the hassle of parking around the block and carrying your luggage all the way to the lobby by booking one of our hotels with parking. Check out deals on some of the 147 hotels in Tampa that offer parking for guests. 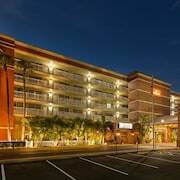 Ramada by Wyndham Tampa Airport Westshore This hotel has a 3.00-star rating. The Inn at Little Harbor This hotel has a 3.00-star rating. Springhill Suites by Marriott Tampa Brandon This hotel has a 3.00-star rating. Motel 6 Tampa - Fairgrounds This hotel has a 2.00-star rating. Do Tampa hotels offer 24-hour concierge services? When you're on vacation, things don't always go according to plan. Travel with peace of mind when you book one of our 29 hotels in Tampa with 24-hour concierge service. That way you know help is always phone call or elevator ride away. Try The Godfrey Hotel & Cabanas Tampa. It's a 3.50 star rated hotel in Tampa that offers concierge services 24 hours a day. Try Embassy Suites Tampa Downtown. It's a 3.50 star rated hotel in Tampa that offers concierge services 24 hours a day. Try Renaissance Tampa International Plaza Hotel. It's a 4.00 star rated hotel in Tampa that offers concierge services 24 hours a day. Try Hyatt Place Tampa Airport/Westshore. 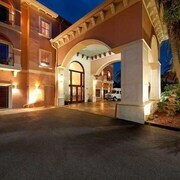 It's a 3.00 star rated hotel in Tampa that offers concierge services 24 hours a day. What about low rates on non-smoking hotels in Tampa? Extended Stay America - Tampa - Brandon This hotel has a 2.50-star rating. The Barrymore Hotel Tampa Riverwalk This hotel has a 3.00-star rating. Hyatt Place Busch Gardens This hotel has a 3.00-star rating. 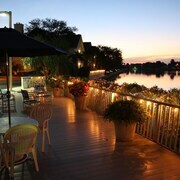 Sailport Waterfront Suites This hotel has a 3.50-star rating. What are the cheapest Tampa 3-star hotel deals? Our 3-star hotels bring you quality accommodations at a lower price point for the perfect, budget-friendly vacation in Tampa. With 72 3-star hotels throughout Tampa to choose from, you still have options. Browse our selection below. The Godfrey Hotel & Cabanas Tampa. Located in Rocky Point, this hotel is 2.7 mi (4.3 km) from Cypress Point Park and 2.7 mi (4.4 km) from Rocky Point Golf Course. Raymond James Stadium and Westshore Plaza Mall are also within 6 mi (10 km). Ramada by Wyndham Tampa Airport Westshore. Centrally located near restaurants, bars, and movie theaters, this hotel is within 2 miles of the Tampa airport, and 5 miles from both downtown Tampa and The Florida Aquarium. 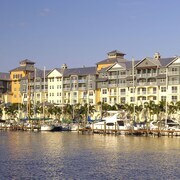 Sailport Waterfront Suites. This Tampa-area waterfront hotel sits on Rocky Point Island overlooking Tampa Bay; the white-sand Caladesi Beach, Lowry Park Zoo, and The Florida Aquarium are all within 8 miles. 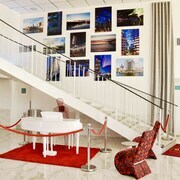 Chase Suite Hotel Tampa. Located in Rocky Point, this aparthotel is 2.9 mi (4.7 km) from Cypress Point Park and 3 mi (4.8 km) from Rocky Point Golf Course. Raymond James Stadium and Westshore Plaza Mall are also within 6 mi (10 km). What are the best deals on 4-Star Hotels in Tampa? Tampa is full of hotels and it can be hard to narrow down where you really want to stay. Luckily, we've done that hard work for you be narrowing you from 202 hotels throughout Tampa, to the 11 4-star hotels in Tampa. Our 4-star hotels in Tampa are exactly what you need for your next family trip, romantic weekend, or solo getaway. Check out our most popular deals below. Grand Hyatt Tampa Bay: Overlooking Upper Tampa Bay, this waterfront conference hotel offers visitors a beautiful natural setting 1 mile from the Rocky Point Golf Club and 2 miles from Tampa International Airport. The Westshore Grand- A Tribute Portfolio Hotel- Tampa: This hotel is 3 miles from the airport; 1 mile from mall shopping; and 5 miles from downtown Tampa and theater, art, and concert venues, The Florida Aquarium, and the Gulf Coast beach. 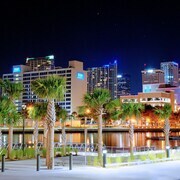 The Westin Tampa Waterside: Surrounded by lush tropical landscaping on Harbor Island, this mid-rise hotel with marina is a 10-minute walk to downtown Tampa and 2 blocks from the Tampa Convention Center. Tampa Marriott Waterside Hotel and Marina: This 27-story business district hotel is next door to the convention center; a mile from the Port of Tampa; and close to the nightlife of Channelside entertainment complex. What are the best activities to do in Tampa? Sunset Pirate Cruise: Starting at just $42 per person. Daytime Pirate Cruise: Starting at just $39 per person. The Florida Aquarium Admission: Starting at just $29 per person. Tampa's Lowry Park Zoo Admission: Starting at just $35 per person. The staff members are awesome 👏 friendly, and courteous. we really like the fact you didn't have to go anywhere , the staff and property we great. mandi at the front desk was excellent when we checked in, she was extremely helpful. We had a wonderful time! Our suite was perfect! Big and roomy for the five of us! The heated pool made my girls happy and the breakfast was delicious! We will be back! Nice place. Beautiful sunset at the tiki bar. Fun atmosphere, nice beach.